Every year, the first weekend of November the Morelock’s have Deer Camp. We all go out to a family ranch, set up camp for the weekend, some of us hunt (some of us don’t kill anything.. and by some I mean usually all of us, we don’t have much luck with opening weekend), we cook delicious campfire meals and share stories (young and old). It is probably my all time favorite Morelock annual event (and I say favorite, because the Morelock’s are awesome and do stuff all the time as a family!). Jared and I took on cooking breakfast for 20 both mornings of Deer Camp this year. Saturday morning we made a traditional breakfast (scrambled eggs, bacon, pancakes and southern style hash potatoes). Sunday morning is always my favorite though. I made my Deliciously Fluffy Biscuits in the dutch oven and a nice thick sage sausage gravy (and of course we have bacon with it too, you can’t go without bacon at Deer Camp- or anywhere for that matter). Mmmm.. Biscuits and Gravy is my favorite breakfast anytime! I LOVE making it for guests! I’m going to share with you the best biscuit recipe I’ve ever found. Now, this makes a fluffy, light, airy biscuit… not like a KFC biscuit or the flaky kind you buy at the store. These are good. Really good. 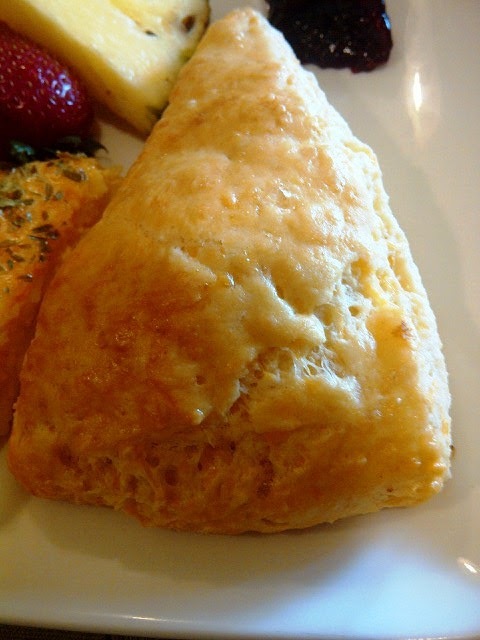 Debbie takes my biscuit recipe and adds fruit or flavorings or cheese to it and rolls it out, cuts it into triangles and makes them into scones. They are soooo good. My secret to this recipe is to mix all the dry ingredients, then use a hand held cheese grater (on the bigger grated side) and grate the (very cold) butter into the dry ingredients. Then just toss it around with your hands, kind of pinch the butter into the flour mixture for a minute. Then I form a sort of well in the middle and pour in my milk and egg and mix it with a fork until the egg and milk are kind of combined (no one wants chunks of egg! Yuck!). Then I mix it with the flour mixture. Don’t over mix, because you will be kneading. I then turn it out onto a very well floured surface and with very well floured hands I knead it 20 times EXACTLY. I don’t know why. I think the original recipe called for 20 times. You may think I’m crazy, but at knead number 20, the dough is perfect. 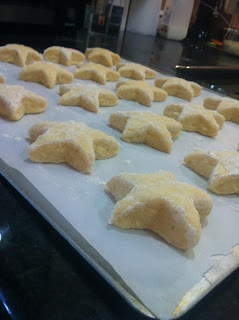 Then I roll it out and cut it- usually into stars for guests, because I’m cheesy like that. And because the Bed & Breakfast is called “Star” of Texas B&B.. get it? Ya, pretty cheesy I know. Guests like it though. And our goal is to make guests happy. So, they get star shaped biscuits. It works. Finally, when they are all cut out and on your cookie sheet (I always line mine with parchment), stick them back into the fridge until your oven is pre-heated to 450*. Bake until golden on top! I’ve found the key with any type of pastry or baked good that has a large amount of butter in it, is to make sure you keep the butter as cold as possible until it goes into the oven. The butter creates layers as it melts in the oven. It creates fluff. It creates light and airy. If you ever work with Puff Pastry, you will learn quickly to keep it as cold as possible, because it will not rise correctly in the oven if it is room temperature. Same with pie crusts. I may have mentioned all this in a previous blog, but that is how important it is. Keep your butter cold people!! This entry was posted in From the kitchen, Recipes by admin. Bookmark the permalink.